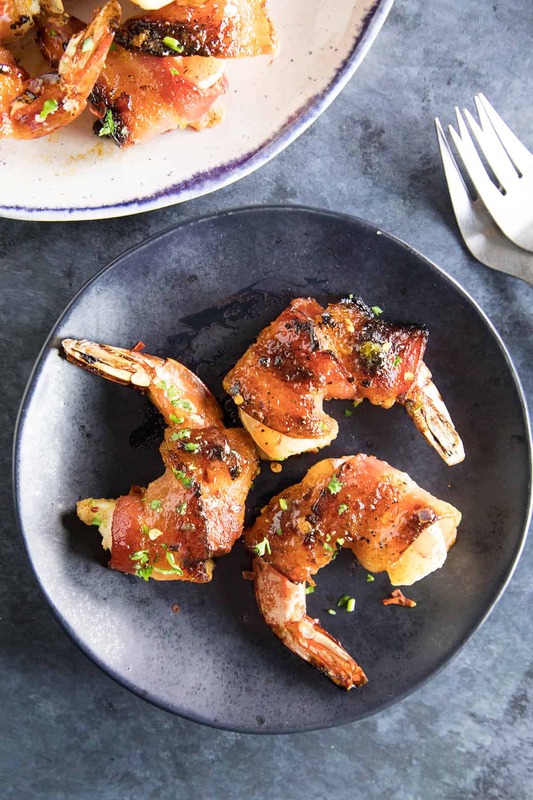 These succulent, seasoned shrimp are wrapped in bacon, brushed with a sweet and spicy habanero-honey glaze, then baked to crispy perfection. Here is the recipe. They’re sure to be the hit of the evening. Father’s Day is just about here, my friends, and I’ve got a super easy yet HIGHLY FLAVORFUL recipe that Dad is SURE to love, and you know what? It’s got that little bit of spiciness Dad craves. 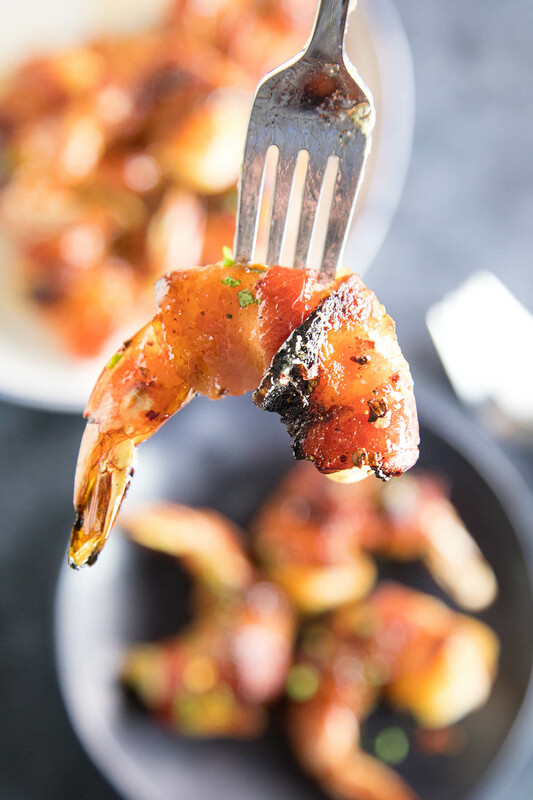 We’re talking Habanero-Honey Glazed Bacon Wrapped Shrimp. YES! And we’re making them with Wright® Brand Naturally Smoked Hickory Bacon. 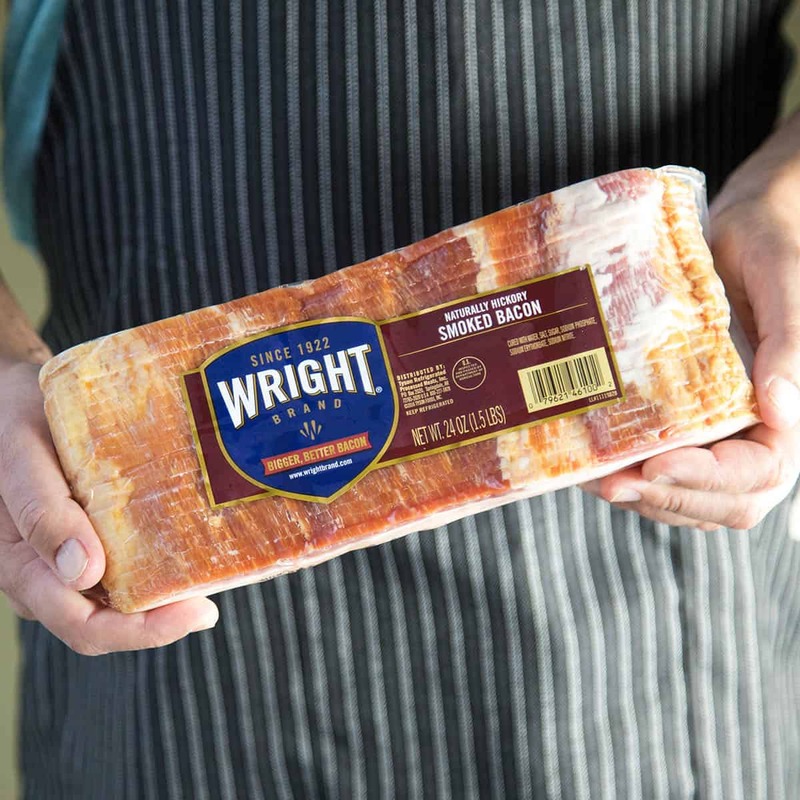 Wright Brand Naturally Smoked Hickory Bacon is hand-selected, hand-trimmed in thick cuts, then wood smoked for 8 hours over hickory chips. The natural smokiness is the perfect complement to the sweet and spicy habanero-honey glaze we’re using for the shrimp. I love that the bacon comes in a re-sealable bag so I can easily store the remaining bacon to use later. I picked up a couple of packages from my local Walmart, in the refrigerated section near the deli goods. 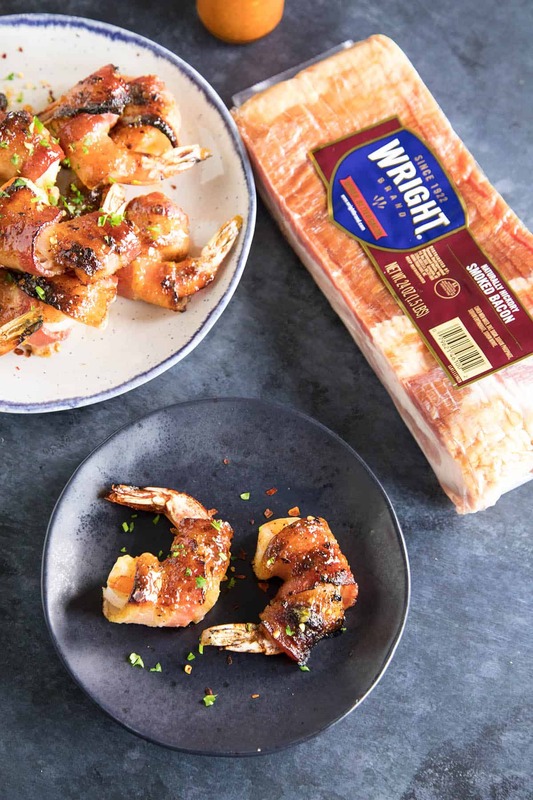 Grab yourself a pack and get cooking, because dad needs Bacon Wrapped Shrimp! The AWESOME thing about this recipe, aside from its fantastic and addictive flavor, is how EASY it is to make. With a prep time of about 10 minutes and only 15 minutes cooking time, you’ll have this ready for Dad in under half an hour! Perfect for hungry dads who don’t feel like waiting. Cooking them up is a snap! 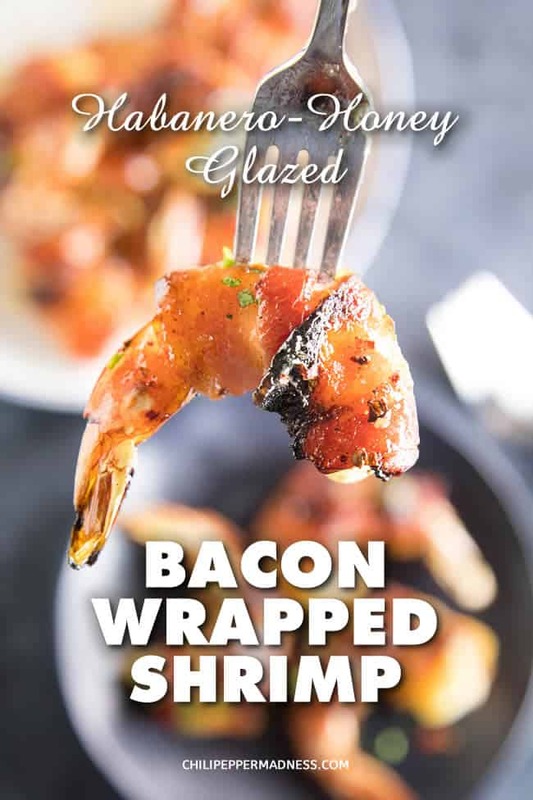 The first thing we need to do is wrap our shrimp in some bacon. Check out these awesome shrimp. 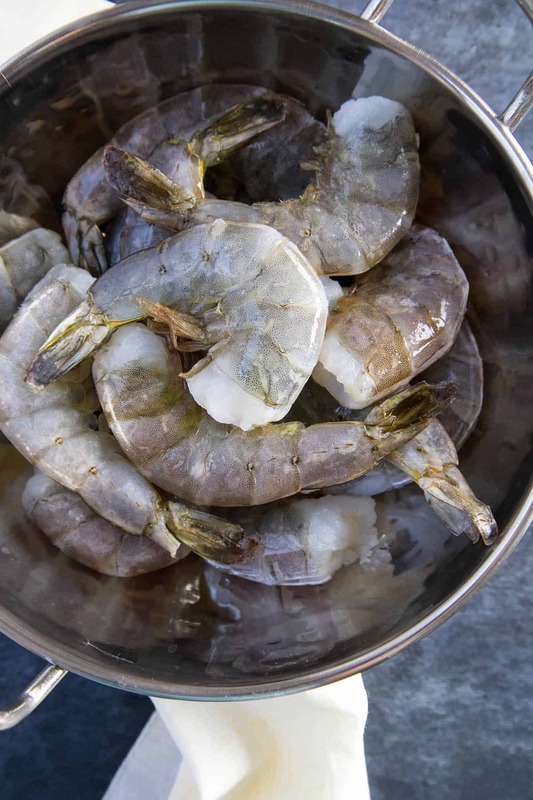 I grabbed some large prawns for this, but you can use smaller shrimp if you need to. Just be sure to peel them, though you can leave on the tails. Next, season the shrimp, then wrap each of them in a half slice of bacon. Like so. 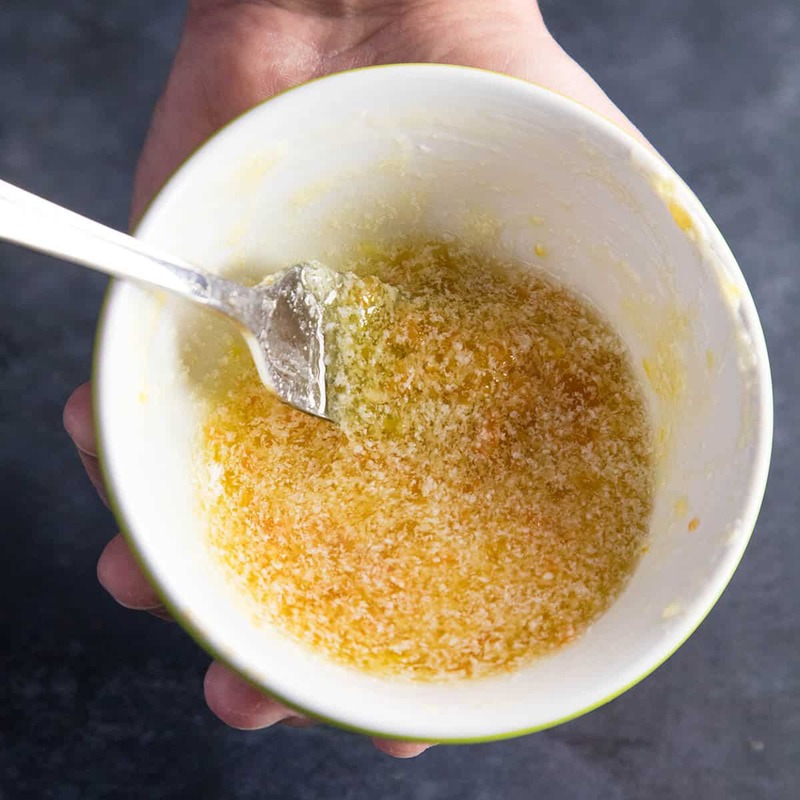 Next, whip up your glaze, which includes pepper jelly, diced habanero pepper, butter, lime juice, and a few drizzles of honey. Mix it all up, like so. 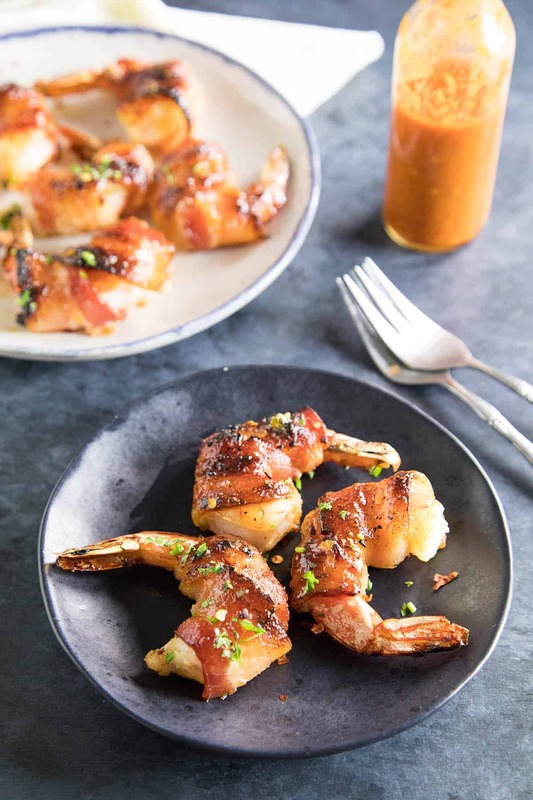 Brush the sweet and spicy glaze over the bacon wrapped shrimp, just like this. Make sure to get them nicely coated. Heat your oven to 425 degrees F and bake them for 10 minutes. The bacon will cook through and will keep the shrimp nicely moist. After 10 minutes, brush on a bit more of the habanero-honey glaze, then increase the oven temperature to BROIL. Broil the bacon-wrapped shrimp another 5 minutes. The bacon will crisp up very nicely. Doesn’t it look awesome? I need some of these right now! Pull them out, give them all one final brush with the glaze, then sprinkle them with some extra chili flakes and fresh chopped herbs. Serve them up! Dad will love these. 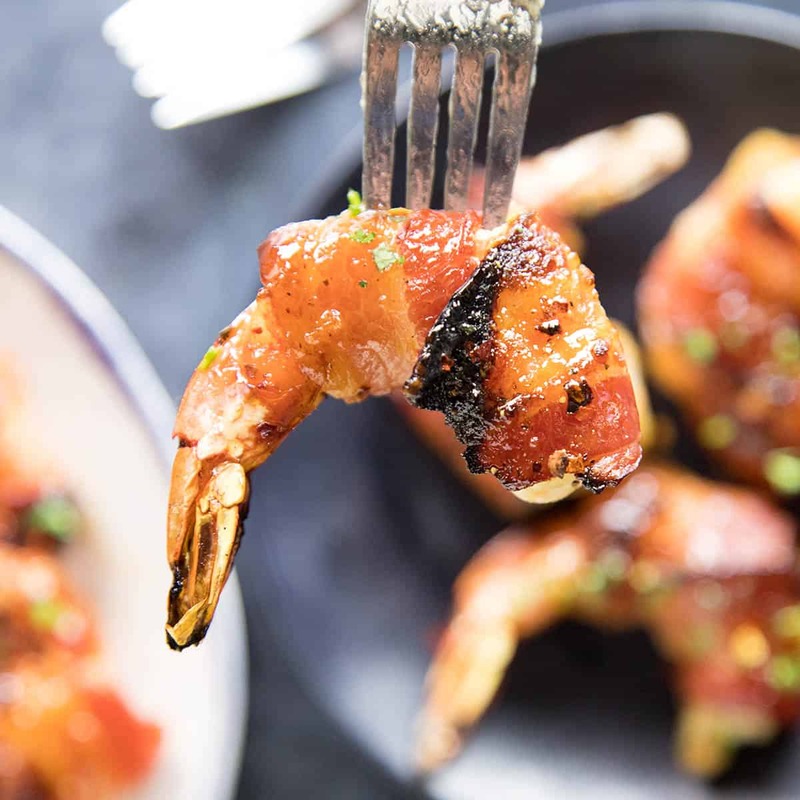 Let’s give him a Father’s Day he’ll always remember, because this Bacon Wrapped Shrimp recipe won’t be forgotten anytime soon. Happy Father’s Day to all the Dads! I hope you enjoy the recipe. Don’t forget to grab yourself some Wright Brand Naturally Smoked Hickory Bacon from Walmart for this recipe. Essential! Let me know how Dad likes it. #ChiliPepperMadness if you make it! I want to see your awesomeness! This thick-cut bacon is crazy delicious. It took the shrimp to a whole new level. Extremely satisfying. The glaze was just perfect for this. Try this with my Hot Honey Recipe. If you try this recipe, please let us know! Leave a comment, rate it and tag a photo #ChiliPepperMadness on Instagram so we can take a look. I always love to see all of your spicy inspirations. Thanks! — Mike H.
Season the shrimp with chili powder, garlic powder, and salt and pepper. 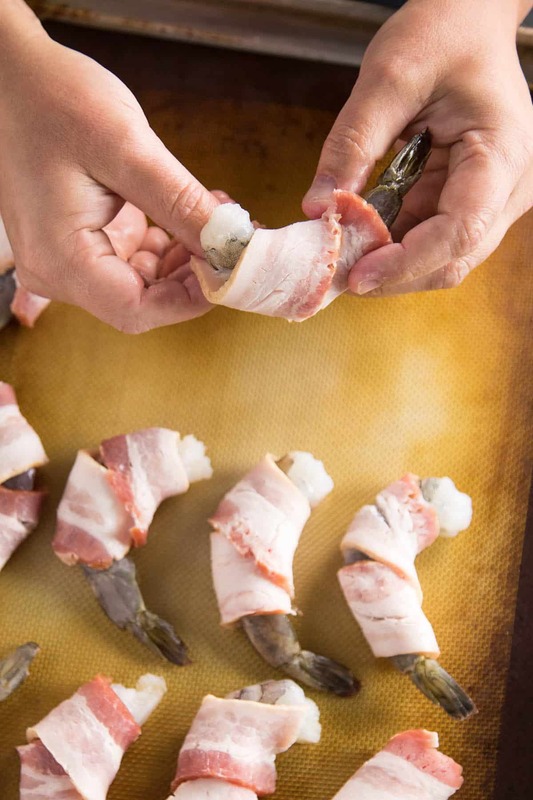 Slice the bacon in half and wrap each shrimp with the bacon. Stretch the bacon a bit in order to get the bacon ends to meet together on one side of each shrimp. 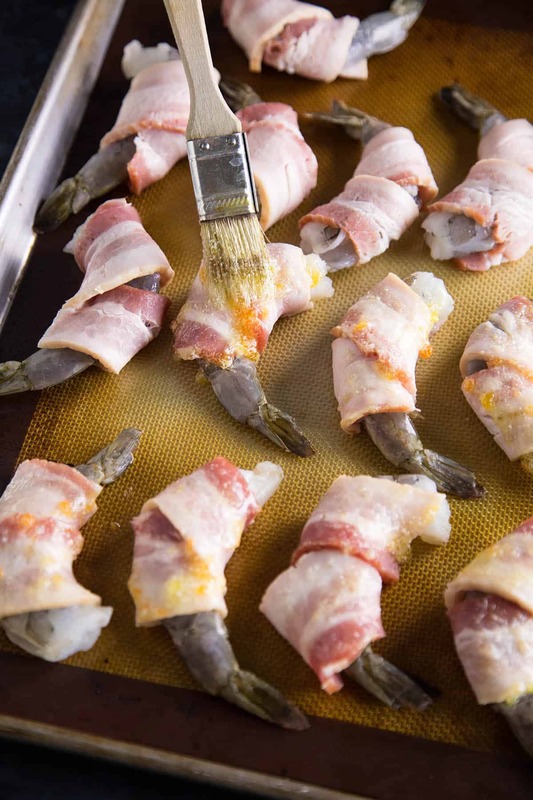 Lay the bacon wrapped shrimp, bacon seems down, onto a baking sheet. 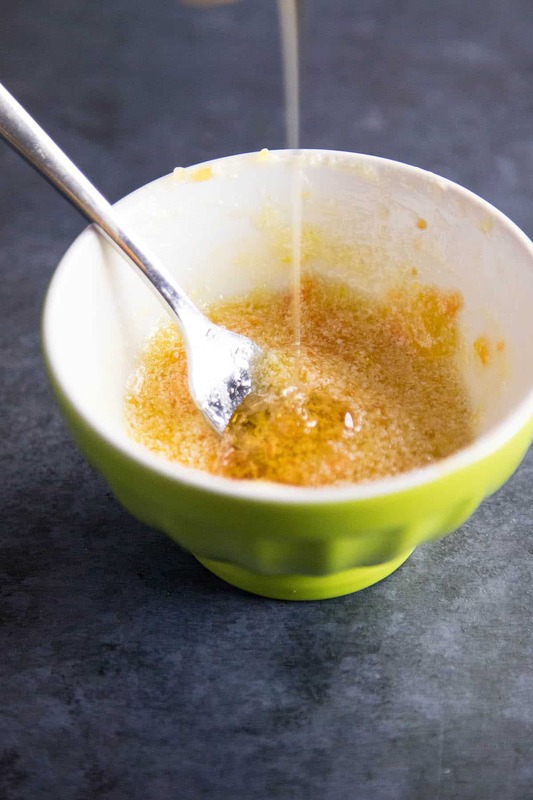 Make your glaze by mixing together the pepper jelly, honey, butter, lime juice and salt in a small bowl. Brush the bacon wrapped shrimp with part of the glaze. Bake them for 10 minutes. Brush the bacon wrapped shrimp with a bit more glaze, then set the oven to BROIL. Broil the shrimp for 5 more minutes, or until the bacon becomes nice and crispy. Remove, then brush with the remaining glaze. Sprinkle with chili flakes and fresh herbs. Heat Factor: Medium. The sweetness of the honey balances out the heat from the habanero. You’ll notice some spice factor, though it isn’t overly hot. Nice, pleasant, delicious. Question: What is the pepper jelly? Is it made or a purchased product? The flavors sound lovely. Daris, pepper jelly IS very lovely. It is just like any other jelly, like grape jelly, but made with peppers. It is sweet and sometimes a little spicy, depending on the peppers used to make it. It is made by simmering peppers in a simple syrup and gelatin, sometimes with other fruits. You can purchase it at your local grocer usually. Or, try making it yourself. See my chili pepper jellies and jams recipes. You are speaking my language Mike, I Soo want to make these . Love how you infuse so much flavor into shrimp. YUM!!! I think you’ve hit all the marks with this one! Sweet, salty and spicy! Looks delicious! Thanks, Karly! These turned out AWESOME!